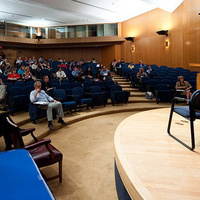 The ICC Auditorium seats 350 individuals and is used for lectures, musical and dramatic performances, films, ceremonies and visits from worldwide dignitaries. Very well organized and inforrmative. This was very beneficial learning experience and there should be more joint SFS and MSB events like this. It's great to see both perspectives. I read The Warmth of Other Suns several years ago and was excited for the opportunity to hear Dr. Wilkerson speak about her work. She is a captivating speaker, empassioned about her work and able to captivate her audience wtih stories and data. It was a pleasure to see and hear Michel Martin in person and watch her work. She sparked conversation and pulled in the audience with her invitation to share thier stories. Of course, much more time is needed to have thsi important discussion and I'm glad that Georgetown is making many efforts to do so. Thank you for this important event.